Human activities such as driving cars, burning coal, and cutting down forests produce gases such as carbon dioxide, methane and nitrous oxide. 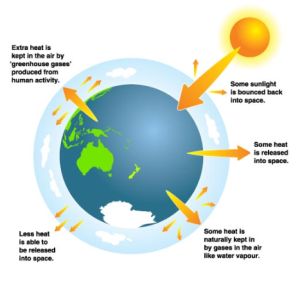 These are known as greenhouse gases as they gather in the atmosphere, wrap around the earth and trap the sun’s heat. The more greenhouse gases we emit, the faster the world’s climate heats up. 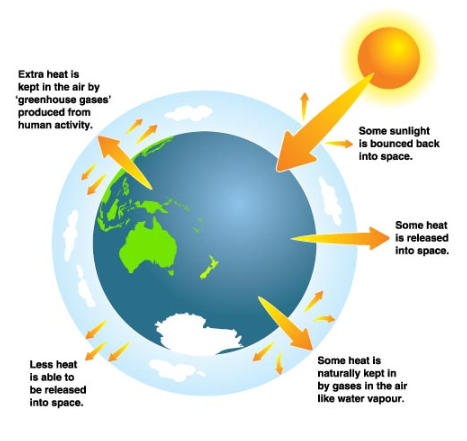 This process is often called ‘global warming’ but ‘climate change’ is a better description as it will not just be changes in the earth’s temperatures that occur. Climate change is likely to result in more, or different patterns of, extreme events such as floods, storms, typhoons and droughts. These changes will have a significant impact on every country’s economy, environment and where we live. Some of the effects of a changing climate are already becoming evident. Increases in temperature were evident from long term meteorological measurements in Pohnpei and Yap. There was not yet obvious trends in annual and seasonal rainfall trends. Sea levels have risen within the FSM. Air temperature and sea surface temperature will continue to increase. The intensity and frequency of days of extreme heat will increase, i.e. more hot days and these days will be hotter. The number of typhoons, on average, may decrease. Annual and seasonal mean rainfall is projected to increase, i.e. more rainfall. The intensity and frequency of days of extreme rainfall will increase, i.e. more days of very heavy rainfall with rainfall getting even heavier. The likelihood of drought events occurring is likely to decrease. Further information is available from the FSM chapter in the report Climate Variability, Extremes and Change in the Western Tropical Pacific: New Science and Updated Country Reports 2014. Much up-to-date information on climate change and what may happen in the western Pacific is also available in the full report. The following pages also provide some more specific information on climate change and sea-level rise and their impacts on Kosrae over the next few generations.